Traveling with a babe isn’t exactly relaxing, but the right toys (and, if you are lucky, temperament) can make a trip enormously easier. We just returned from a long weekend involving 8 hours roundtrip car/boat travel. We planned our timing carefully, scheduling the longest car leg over mid-day nap. Based on previous travel experiences, the options were: 1) use naptime to travel; 2) spend 2 hours twisted uncomfortably picking up dropped books and toys; or 3) try ineffectively to placate squirmy, screechy babe. Our well-laid plans of course went out the window. In one direction we hit traffic that woke the babe up for the remainder of the drive; on the way back she didn’t sleep at all because she had fallen asleep during the earlier 45-minute ride to the ferry. We thought we were doomed, but: 1) the babe was in terrific spirits (i.e., she enjoyed babbling to herself and singing songs); and 2) we were armed with the Anatex Shape ‘n Color Coaster. 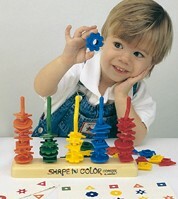 Anatex is famous for its wooden toys; the bead maze cubes at your pediatrician’s office are likely Anatex. The Shape ‘n Color Coaster couldn’t be simpler, but the wooden base, five pegs, and 50 slide-on pieces (five shapes and colors) offer a fun and compact way to learn about shapes, colors, counting, and grouping. Retails for $19.99; I got mine for an apparently accidental (mismarked) $9.99 at Whole Foods.